The students grab their drum and find their place in one of the rows, waiting respectfully for their teacher’s instruction. Marlene Clifton stands in front of the youths and introduces the first song they will perform — a welcome song by Don Wells of Lax Kw’alaams. She explains he has given them permission to use this song and they use the song to honour the Tsimshian for allowing them to be on their territory. “We don’t get to just go ahead and use anybody’s songs or anybody’s stories because those are significant to those families,” Clifton said at Conrad Elementary School. The Aboriginal family resource worker visits schools across the district to teach drumming to the students. Clifton’s background is from the Gitxsan in the Hazelton area. “Culturally our families have always had drumming and singing as a way of celebration or mourning and as a way of bringing family together,” she said. Three of the songs she shares with the students come from the House of Haxbegwootxw, from the Skeena River, where she is a member. She received permission from her chiefs to share the songs with the kids she works with but the protocol is they can only perform those songs when they are with her. Clifton became involved in drumming at the school district when her family was asked to organize a presentation for the raising of the totem poles at Charles Hays Secondary School. Her family got together for three days to practice before performing at the Jim Ciccone Civic Centre for the celebration. She was already working in the school district, at Westview Elementary and a teacher asked her if she would do a project with her to make drums with a Grade 2-3 class. They made the drums but they couldn’t keep them at the school due to traditional protocol. “Those drums belong to the kids because culturally when you make a drum a bit of your spirit goes into making the drum so you’re not supposed to give away drums unless you have absolutely nothing else to give and somebody has just been exceptional in your life,” Clifton said her, who made own drum from caribou hide 25 years ago. With the first spark of interest in Clifton’s knowledge of drumming, she began teaching students in the schools where she worked. Nine years later, Clifton is now meeting with students from schools across the district. “She’s an important resource,” said Paramjit Khaira, the vice-principal at Conrad Elementary. 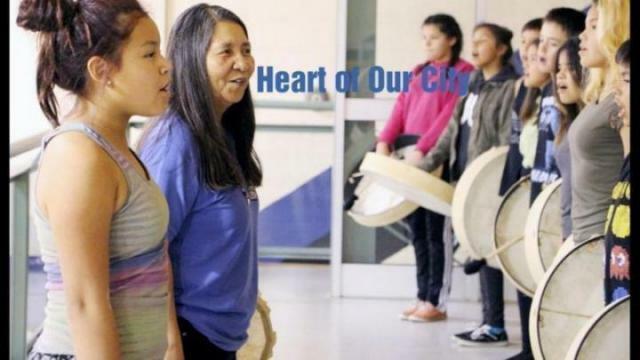 At the Prince Rupert Middle School, she has an after school club with 13-15 youths who perk up when they see their longhaired gentle-speaking drumming teacher walk into their school. “Hello Ms. Clifton!” They call out. When she asks one of the students if he’s joining her in the gym to drum, he bobs his head up and down with a grin. Minutes later, the upper level of the gymnasium is full with students holding the large drums that came from a manufacturer purchased and lent out by Pineridge Elementary. The vibration and beat is much louder than the smaller drums in the other schools. Being able to share her culture within the school district gives Clifton a lot of pride, “because I know who I am and I know what our protocols are in different territories. I know this isn’t my territory. I honour the people that the territory does belong to,” she said. Clifton comes from a family of 10 children. She was born and raised in Port Edward. Her grandmother helped deliver her and two hours after she was born her mother went to work in the net loft at the cannery. Before working at the school district, Clifton also worked in the cannery. When she had her children she stayed at home to raise them and volunteered her time in the schools while they grew up. Eventually, she took on a job as a library assistant and she’s worked with the school district ever since. Her husband, Charles (Wakie), of Hartley Bay, is “the wind beneath her wings” and she said he’s always done everything he can to make sure that she feels what she does is important. The family moved to Prince Rupert 12 years ago and she still visits Hazelton often for feasts. Clifton’s favourite song to drum is a cleansing song and it isn’t one she teaches the kids. “I use that for when we’re honouring people that have passed on because the song is a cleansing song that depicts someone who has gone through some turmoil in their life and they’ve completely changed their lifestyle, so it’s changing, it’s a new beginning. I just love that song,” she said. She also performs the song when someone retires from the district. Clifton herself hopes to retire in the next three years, but she’ll never stop drumming for her family, for her community or for the kids.